Volvo’s timeless beauty, the Amazon, was introduced to the world for the first time 60 years ago. Named after the female warriors in Greek mythology, it is still one of the most iconic models in Volvo’s history. Volvo’s new four-door model was revealed in the first weekend of September in 1956. It had its première in the Swedish town of Örebro, with the elegant car differing greatly from the common perception of what a Volvo should look like. The new car was the company’s second postwar model, following on from the PV444, and had been named Amason - spelled with an ‘s’. The name came from Greek mythology, in which the Amazons were female warriors. The spelling was changed to the more internationally viable Amazon prior to the launch of production in 1957. Unfortunately, the German moped and motorcycle manufacturer Kreidler also happened to launch a moped called Amazone at the same time, which meant the name was unavailable in a number of key markets. A deal was reached to allow the Volvo model to be known as Amazon in the Nordic markets. In the rest of the world, the standard model was known as 121 while 122 was used for the sport model. The estate model with a standard engine was called 221, while 222 was used for estates with the sport engine. However, the car is now known as Amazon around the world. The first few years of Amazons were incredibly elegant. Between 1957 and 1959, all cars were two-coloured. The combinations on offer were black, midnight blue or ruby red bodies with a light grey roof, or a light grey body with a black roof. From 1959, it became possible to buy an Amazon in just one colour, and 1961 was the final year of production of the two-coloured cars. The 1958 Amazon Sport was developed for customers who wanted more power. With twin SU carburettors and a sharper camshaft, the engine could generate 85 hp SAE. In 1959, Volvo’s patented three-point seatbelt became a standard feature in the Amazon - a world first! No single other safety feature has been anywhere near as significant. It is estimated that at least one million lives have been saved by the three-point seatbelt over the course of its 57-year lifetime. February 1962 marked the introduction of the estate edition of the Amazon. The difference between this car and the Duett van was substantial. The Amazon estate was an elegant car with an American-inspired boot door that was split horizontally. The sportiest edition of the Amazon was the 123 GT, which borrowed its engine from the 1800S sports car. The 123 GT was launched as a 1967 model, offering 115 hp and overdrive. The wing mirrors were attached to the front fenders, extra lights came as standard and a tachometer was mounted above the dashboard. Product development on the Amazon continued despite the introduction of the 140 series in 1966. Both the Amazon and the 140 series received the new B20 engine for their respective 1969 models. The larger volume provided better torque and a slight increase in power. 667,791 Amazons were built between 1956 and 1970, making it Volvo’s most manufactured model at that moment. The Amazon switched Volvo’s focus from the domestic market to the export market - a total of 60 per cent of Amazon’s manufactured were sold outside of Sweden. In 1963, Volvo’s plant in the Canadian city of Halifax opened its doors. Cars were built there for the North American market. On 3 July 1970, the final Amazon was built at Torslanda. It was dark blue and was driven straight into the collection of cars that later became the Volvo Museum. Around eight per cent of the approximately 297,000 Amazons sold in Sweden are still around! The most common edition is the model from 1966, of which there are still 4,804 registered cars. In total, there are 24,282 Volvo Amazons registered in Sweden. The Swedish police cooperated with Volvo, and they jointly developed equipment that was later included on ordinary production cars. The police cars featured disc brakes, brake assist and radial tyres several years before they became common in production cars. The police Amazons were equipped with rear window fans and there was a button by the steering wheel connecting the windscreen cleaner with the fastest windscreen wiper setting. Colin Powell, the USA’s former Secretary of State and Chairman of the Joint Chiefs of Staff, is a big fan of cars. He has owned several classic Volvos, including a 1966 Amazon estate. When he left his post as Chairman of the Joint Chiefs of Staff in 1993, he was given an Amazon in dire need of renovation by President Bill Clinton and Vice President Al Gore. The 1963 Geneva catalogue featured the Volvo 122S Cabriolet - its creator was listed as Jacques Coune, the Belgian coach builder. It was a beautiful conversion, featuring doors without window frames, door openings that were gently rounded at the back and rear lights that were angled forward. The catalogue gave the impression that it was a production car, but Volvo had nothing to do with the initiative and only four were built. Advertising man Amil Gargano of New York took on the Volvo account in 1962. 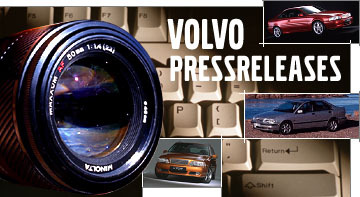 He concluded that Volvos could withstand practically anything, and this became the brand’s USP. An advertising film shows an Amazon being driven hard on gravel roads. The advert’s payoff is just as clear as it is impossible today: “And you can drive it like you hate it. Cheaper than psychiatry”. There were plans to put a V8 in an Amazon - an evolved version of a truck engine. Five prototypes were said to have been built, but in the end Volvo’s management realised that a V8 was not suitable for the Amazon, not least given there was no six-cylinder version and the leap from a four to a V8 would have been too great. The Amazons built in Volvo’s assembly plant in Halifax, Canada were marketed under the name Volvo Canadian. When Volvo’s range of models expanded thanks to the Amazon, Volvo regained its position as Sweden’s best selling brand of car in 1958. This is a position it had retained every year since then. In “All The President’s Men”, the movie about the Watergate affair that forced the resignation of President Richard Nixon, Washington Post reporter Bob Woodward, played by Robert Redford, drives a white Amazon.